G101.3 WFMG was on campus for the Brains Up Unveiling held in the Graf Center. Mike Posner and the BrainTrust is the first G101.3 Summer Concert Series event and the first hosted in Richmond. Pre-sale tickets cost $10 for students, $20 for general admission. If available, tickets can be purchased at the door for a cost of $15 for students, $25 for general admission. You must be 18 years old in order to purchase a ticket. Tickets may be purchased at the Office of Campus Life, located in Springwood Hall room 107. Hours 8 a.m. to 6 p.m., Monday through Thursday, and 8 a.m. to 5 p.m. on Friday. 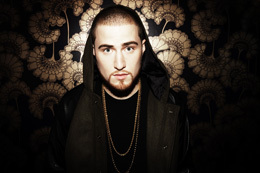 Mike Posner is a 24-year-old singer, songwriter, and producer. His debut album 31 Minutes To Takeoff is an eclectic, lovingly crafted collection of soulful tunes that showcase his innovative spirit and motivation to create something that sounds like nothing else out there. The album was released by J Records in August 2010. His new album, Sky High, will be released in 2012. David Sanders, a general studies major, is a member of the Student Activity Advisory Team. Sanders, who also plays on the men’s basketball team, said he is looking forward to the concert. The doors will open at 7 p.m. with the concert starting at 8 p.m.
For more information, call the Office of Campus Life at (765) 973-8240 or visit iue.edu/campuslife.